Top-Rated Indoor Decorative Square Pillow! The every-style accent pillow; this Simple Decorative Pillow works in any space. Perfectly cut to be extra fluffy. 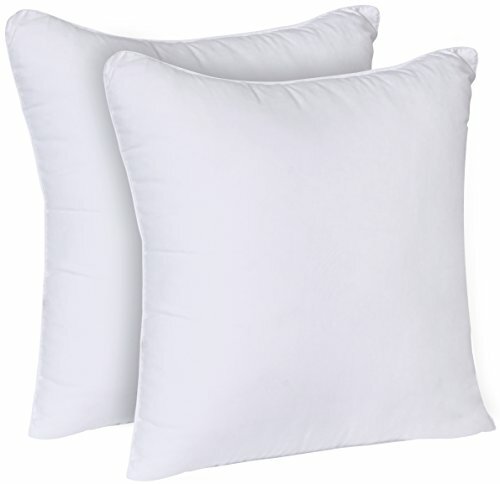 These Pillows are mold and mildew resistant and feature UV protection to resist fading. Removable pillow covers make washing really easy. Spot clean or hand wash fabric with mild detergent. Lounge in bright style against this pillow of weather- and UV-resistant corded outdoor square 18 inches pillows. Note: Please give 48-72 hours to the pillow to fully expand. You can also tab or press the pillow few times to hasten expansion. By placing pillows in the sun for a few hours on a bright day will evaporate the moisture that builds up over nights of use and the pillows will fluff up over the course of the day. You could also hang the pillows outside on a clothes line, if you have one. If you have any questions about this product by Utopia Bedding, contact us by completing and submitting the form below. If you are looking for a specif part number, please include it with your message.